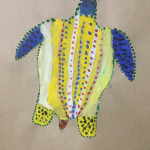 For the senses unit in art students created art using senses. 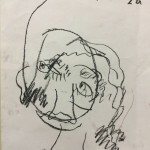 They did some some blind drawings, painting to music, texture collage and also improved their drawing skills with a focus on the portraiture and the facial features associated with the senses. For the Signs and Symbols unit students created their own alphabet of symbols, a street sign collage, a dot painting of an animal and their own printed coat of arms. 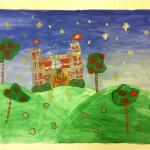 During this first unit, students practiced the skills of drawing, painting, collage and printing. For the Migration unit, students discussed the concept of Utopia and thought about what factors would feature in their ideal society and imagined a place that would have the pull factors to entice them to migrate to by choice if they could. At the same time we discussed and practiced how tone, scale and perspective help to show distance in a landscape picture. 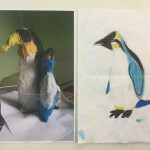 For the unit on ‘Sharing the Ocean’, students were asked to research an ocean animal, observe and draw it, then try to build up the basic form using cardboard, newspaper and paper mache. The completed form was painted into detail to show the specific colouring, pattern and texture of the animal.